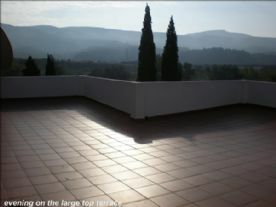 Jalance is a small village situated in the Vale of Ayora between the larger towns of Almansa and Requena. The village is about 1 hours’ drive from the airports of Alicante and Valencia; both airports have direct flights to the U.K, Germany, and Holland with the low cost airline Ryan Air and Easy jet. Electric transformer overhauled new parts added and a full service given, new electrics throughout the house, new plumbing system installed two new 2 thousand liter water tanks installed, new filtration system installed, brand new sewerage system installed, all roofs re-roofed all floor tiles dug up and new ceramic ones laid throughout the house. Old tiles taken off the swimming pool sides and new blue and white mosaic put on, a new filtration system installed, all old wooden windows and shutters taken out and replaced with new bronze colored aluminum double glazed ones, new phone lines installed, high speed internet connection and Wi-Fi installed all internal doors taken off and brand new ones fitted. A no through road leads you to a graveled driveway with parking for 8 or 9 cars you enter the house through a large pine door into the hallway. Hallway 6.75 square meters with full size peach dressing mirror, a door leads you into the large lounge diner. 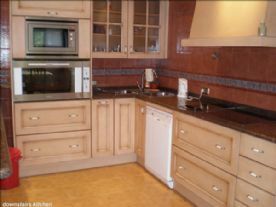 Kitchen 15.95 square meters with large Franke built in oven built in microwave and a Balay 5 ring ceramic hob with large Mepamsa cooker extractor above it. From the kitchen a door leads you into the larder fully tiled with white tiles and three marble shelves. Lounge T.V area18.49 square meters. Large built in wood burning stove and plenty of Sockets and the lights all have dimmer switches. Dining room and second lounge 58.3 square meters. The dining area has a tented ceiling and you have three large windows with which to enjoy the view over the orchard and the rest of the land you can also see the castle in the village from here. Toilet and wash hand basin 2 square meters. Toilet and bathroom 5.27 square meters which has a bath with shower above wash hand basin, toilet, and a bidet. Bedroom 1 7.75 square meters and a door leads you out onto a balcony. Bedroom 2 14.62 square meters. This also has a door that leads out onto a balcony. Bedroom 3 15.51 square meters this room has a large double glazed window that looks out onto the front of the property. Bedroom 4. 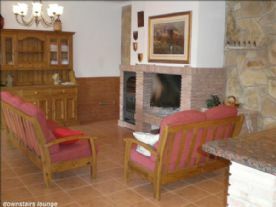 18.49 square meters, this also has large windows that look out over the front of the property. From the corridor there is a door that leads out onto the upstairs terraces. Terrace and balconies 94.55 square meters. 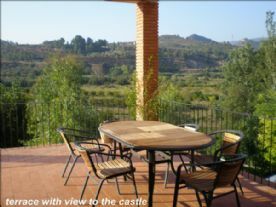 From these terraces you get the most wonderful views over the land and you also see the village castle and the swimming pool. Going back down to the lounge diner a door leads you into a corridor which is 6.73 meters it has an airing cupboard and 4 built in wardrobes. 1 bathroom and toilet 5.27 square meters, it has a column shower wash basin toilet and a bidet. 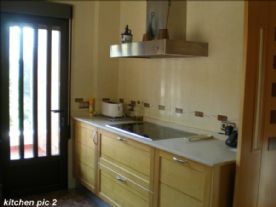 1 single bedroom 5.27 meters with a door to the terrace..
1 double bedroom 7.75 square meters with a door to the terrace. 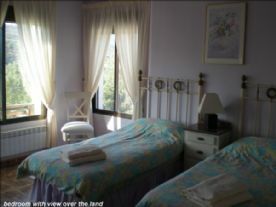 1 double bedroom with a large window looking out onto the front of the property. From this corridor a set of steps lead you down to basement level which has the following areas. The office 8.16 meters points for telephone, fax machine, photo copier and also a store room 1.19 square meters. Toilet and wash hand basin 1.5 square meters. Another pine door leads you to the laundry room and storage area. Laundry room and storage room 56.64 square meters, this room houses the oil central heating boiler, washing machines and a sink with hot and cold water. Kitchen and lounge/dining room 56.64 square meters. This room has a ceramic hob, a huge open wood fire, a microwave oven, a wood oven and a dish washer and a door from this room gives entry into the wine cellar which is about 12 square meters. From the office a door leads you outside to the downstairs terrace. This has the oil tank and clothes line and give access to the garden and swimming pool. With under water flood lights for those hot summer nights. With a metal door and power points. It has a open wood fire and a door leading out onto the terrace. A very private suntrap and a great spot for joining friends for that evening glass of wine. Shower and toilet 3.45 square meters. This has a shower and wash hand basin and a toilet. This has a 4 ringed gas cooker and a fridge freezer and a microwave. This is a double bedroom with built in wardrobe. On the landing is a double glazed window and a door to the outside terrace and a washing machine and a shower room. Shower room 2.88 square meters. Bedroom 2 8.85 square meters. This is a double bedroom has got great outside views and a built in wardrobe. Bedroom 3 15.32 square meters. Next door is the old farm house of some 160 square meters which could be renovated to give you more space if you need it. The house stands on 24,000 square meters of land; more than half of it has got a plantation of Italian Poplars which you harvest about every 10 years. The property is being sold fully furnished you can either use it as a very large family home or as a Bed and Breakfast establishment as this is what we are doing with it at the moment . Other possibilities for the use of the property are as follows. Working from home on the internet. 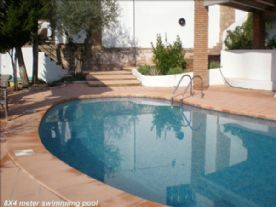 If you wish to visit the property we can pick you up from either Alicante or Valencia airport and show you the area. 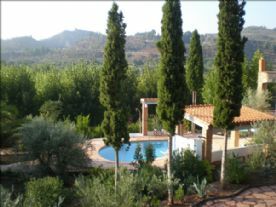 There is also the opportunity to purchase two plots of productive Olive orchards. One orchard is approximately 4 hectares and the other on is approximately 2 hectares they are located about 4 kilometers from the house.